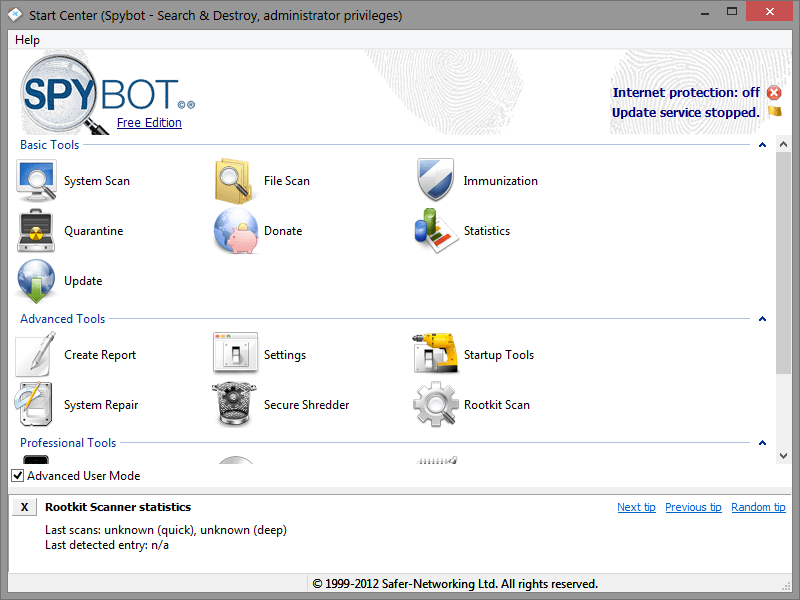 Spybot - Search & Destroy detects and removes tens of thousands of spyware and similar malware from PCs. It can also clean usage tracks and fix registry issues. 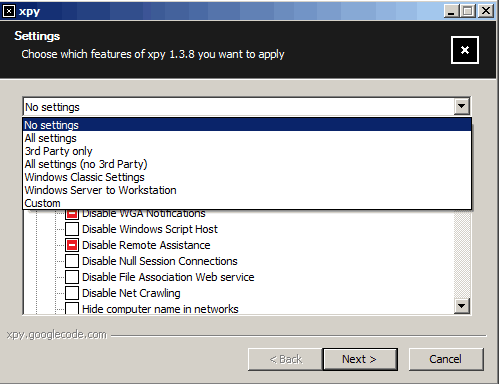 Spybot - Search & Destroy Portable is the PortableApps.com official version of the standard program. Stealth: ? Yes. If you clean anything from the local PC, that would not be stealth, of course. 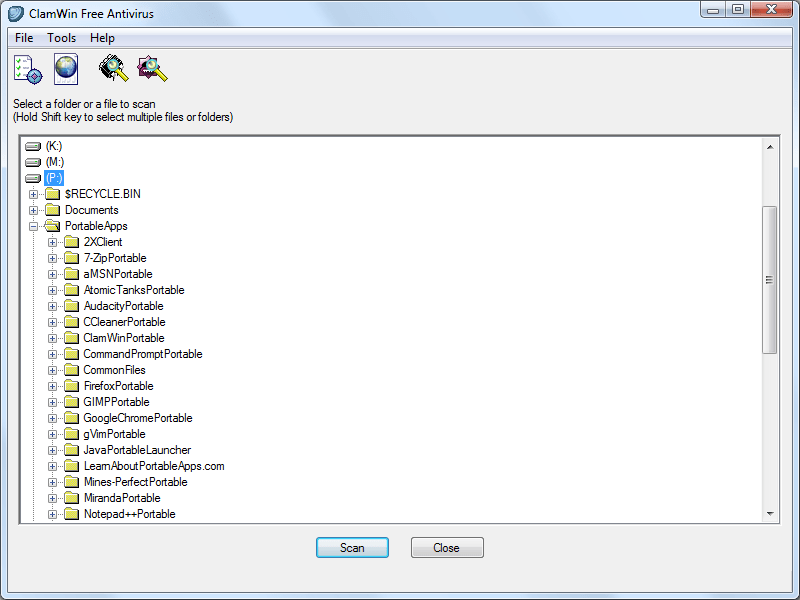 How to extract: Download the self-extracting EXE and extract to a folder of your choice. Launch spybotportable.exe. Beware! Even you don't clean anything, the portable package leaves numerous traces in the system: hard to find registry keys (search also for "Safe Networking Limited") and a stubborn folder in ProgramData plus one in AppData\Roaming (unfortunately I didn't wrote down all the traces before cleaning up). ClamAV is a virus and spyware scanner whose database is constantly maintained by a group of volunteers and updates are always available for free. Note that the program does not contain an on-access real-time scanner; you must manually scan a file in order to detect malware. ClamWin Portable is a portable wrapper for ClamWin and can be modified to automatically update virus database periodically or during startup. How to extract: Download the self-extracting EXE and extract to a folder of your choice. Launch ClamWinPortable.exe. If anyone here wants to take over maintanence of ClamWinPortableDBUpdate, please send me a message. I no longer use Windows and so no longer maintain it. AVZ AntiViral Toolkit is a set of advanced tools capable of removing SpyWare and AdWare modules, network worms, Trojan horses, Dialers. The utility implements specialized algorithms for detecting keyloggers, finding and blocking rootkits, and more. Writes settings to: Saves performed manually. Unicode support: Partial. Scans Unicode named files, but does not display their names properly. How to extract: Download the ZIP package and extract to a folder of your choice. Launch avz.exe. Don't forget to update the definitions or you can download from here. What's new? See Russian changelog here. Added latest virus definitons link. AVZ is now at v4.41. Used it for the first time last night....outstanding app. It saved an important thumb drive. Writes settings to: User profile folder. A single setting is written to indicate whether you have accepted the license agreement. How to extract: Download the "bin" ZIP file and extract to a folder of your choice. Launch xpy.exe. The Website link to xpy.whyeye.org has the most current stable version as being up to xpy v1.3.4 but the download link at xpy.whyeye.org is bad. Thanks Napiophelios. Updated entry and download site.